One of the things I’ve been working on while away from my blog has been the ADF Dedicant program. Wisdom: Wisdom is an understanding of the universe both broad enough and deep enough that one can understand the impact of his decisions. Only then can one be held truly accountable for his deeds. This isn’t a requirement that one possess any form of omniscience, only a mingling of “common sense” and enough experience that one understands that Deed A provokes Reaction A and, perhaps, a moral maturity that allows one to prefer certain outcomes to others. It is this experiential aspect to wisdom that makes our earthly elders worthy of respect as repositories of wisdom. As one lives and learns, he sees with his own eyes that the worlds work a certain way. The deeper the understanding of how one’s decisions impact the greater community and the earth herself the greater one’s wisdom can be said to be. I follow Aristotle in insisting that wisdom is incompatible with mis-deeds. Wisdom promotes courage by allowing us to see when and where we should stand and fight and the awful consequences of cowardice. Wisdom chooses our fears, but we do not allow our fears to choose our deeds. Wisdom is a cornerstone of piety. Wisdom tempers courage and forges it. Wisdom allows our practice of simplicity to be sincere and effective. Wisdom helps us find our proper place so that our piety is not in vain. Piety: Piety is an understanding of one’s proper place in the world of men and spirits and striving to fill that role in relation to one’s self, one’s community and the Earth herself. Arrogance is assuming a higher place than one has earned. Derogance is assuming a lower place in hopes of avoiding the responsibilities. None of this is to argue a fascist position that one is born into a hierarchy and need stay where one was born. Piety is that desire to preserve those traditions of that past that still serve us well and to promote new ideas still in harmony with the folk and the Gods when old ideas no longer serve. The individual has a responsibility to gather knowledge and grow in wisdom and strength in order to better serve the community and the Gods. This is the common view of piety; that one respect and honor and obey the Gods. But this narrow view fails to encompass such specifics as “filial piety” and fails to recognize that all deeds are either pious or impious. Every one of us is born to be a steward, a teacher, and a servant. Knowing what causes to serve is wisdom and serving them as well as possible is piety. Piety requires wisdom and courage. It supports perseverance by reminding us that we strive not for ourselves alone. Vision: Vision is that intellectual ability to gaze into the future and see what could be and what should be. It balances one’s desires for a better future with an understanding of what is possible, what is likely, what is desirable and what is mere fantasy. In this, it is dependent on wisdom. Once one can discern what is possible and good, one must then have a vision of how to achieve such a future in a manner that doesn’t undo the good inherent in the vision. A vision of material comfort and physical safety for all people everywhere is a fantasy. But it’s made worse if one rests that vision on denying personal freedom and responsibility. In this way, our vision must be curbed by the constraints of reality and an appreciation of the necessity of imperfection. Vision requires wisdom. Vision is the foundation of integrity. It is meaningless without courage. Every act taken in furtherance of our vision is a manifestation of fertility. Courage: Courage is the capacity to make decisions out of compassion and love rather than fear. Whether it is a physical deed or a word spoke, courage is the decision to act (or refrain from acting) based on the needs of a moment and the future rather than one’s instinct for immediate self-preservation. It is almost cliché to quip that courage is seeing the danger and proceeding anyway. For my youngest son, jumping into the deep end of the pool requires courage where it doesn’t for his older brother or myself. We see no danger. But something troubles the youngest and he shakes and he knows something awful stands before him as he approaches the edge of the pool. Fear begs him to back away, it insists that he preserve himself and stand. If he lets fear make this decision, he loses more than an afternoon playing in the water. So, we ask him, “What do you do when you can’t be brave?” And he answers, “You pretend to be brave.” He still shakes. He still feels the fear. Sometimes…he jumps. We become brave by doing brave deeds. It is vital though that we learn authentic courage rather than simply acquiring a “fear of fear.” Courage is required for all good deeds. Nothing is easy. As I said; we cannot let fear make decisions for us. This is not the same as embracing foolhardiness and risk for its own sake. We do not court danger but we cannot let fear move us to act in ways that do not further the cause of Right and Good. We hold our values and our honor so closely that, when the time comes to give our lives in defense of our values and in pursuit of the Good, it will seem as though our lives meant nothing to us. But this courage must be tempered by wisdom lest it become a recklessness that does more harm than good. All other virtues are mere echoes without courage. But without wisdom, courage is simply foolhardiness. Integrity: Integrity is one’s commitment to live according to his vision of what his own life should be. A man who can be counted on to always be selfish and greedy exhibits integrity when he encourages others to live so and never fails to serve himself first. That is integrity…but it lacks wisdom and piety. It is far more common for people to praise the good and claim to serve it even as they fail again and again to accomplish deeds or serve causes that further the good. It isn’t usually the case that people are devious servants of Evil, but we are far too often complacent and lazy. We mean it when we lament the evils we encounter. But that sincerity is not always enough to overcome the inertia of our modern, sedentary lives. When one possesses integrity, you can see their beliefs in their deeds. Integrity is the honest pursuit of one’s vision. It is the act of manifesting one’s piety. It requires courage and perseverance. Hospitality: Hospitality is the generosity we must extend to those with whom we share the same moments whether kinsman or stranger. It is, of course, a consideration of what is owed a guest by a host and a host by the guest, but it is, also, a recognition that we carry nothing with us to the grave and leave behind a world impacted by our passage for better or worse. Hospitality, in its fullness requires that we consider our community entire and the well-being of future generations. In our days, we encounter those who can be said to possess the world and its delight’s less than we do. Whether it is a homeless person, a child, or someone else whose circumstances deprive them of full participation in the tribe’s affairs, hospitality requires us to recognize that in very real ways, that person is our guest in that moment. By stepping forward and taking our place on the wall, we assume responsibility for the lives and well-being of others. What greater generosity is there than that we share our strengths and spend our lives in pursuit of the well-being of all? Give your time, your wealth, your energy to those people whose need hampers their development or the advancement of us all. Hospitality, generosity, largesse requires courage. The coward fears that he will not have the strength to feed himself again if he shares his meal with the hungry. When we exercise largess and keep an open table, we remind the world through our example that we have the strength and confidence to make our way into the future. Hospitality is a manifestation of piety as we recognize that we are not alone and that it is our place to feed and clothe our people. It requires the wisdom to discern what is needed by ourselves and others. It is not hospitality to offer an alcoholic a drink no matter how prettily he begs. And the simplicity of our own needs should be recognized so as to free up resources that we can share with those whose grasp is insufficient for their own modest needs. In this way, practicing moderation increases our capacity to practice hospitality. But hospitality is not limited to physical needs. The emotional needs of prisoners, children, and the entire community must also be addressed. We must, by our very presence and our words and deeds, convey to our community that they are safe and valued and supported. Moderation: Moderation is the ability to perceive our own needs and to live according to those needs rather than our whims and desires. This is not to suggest that we must all adopt some ascetic existence bordering on starvation and devoid of joy. One of our genuine needs is recreation and laughter and occasional EXCESS! Just as moderation requires that we curb certain appetites such as junk food or harmful, immoral behavior, we must also cultivate certain appetites. But we must cultivate the wisdom to discern when our mere whims (as opposed to our legitimate desires) impede our progress and our ability to live meaningful lives in service to the community, our Gods and our ancestors. Greed and gluttony are the vices of cowards. Greed and gluttony are possibly the two greatest vices threatening the survival of humanity. In our practice, moderation makes it possible to exercise a greater generosity. Fertility: Fertility is the capacity to create and increase. The inspiration to create is not enough. One must take that breath and proceed with action turning that inspiration into a work that will outlast us as it touches others. We all leave a mark as we pass through the world. Fertility is the virtue we must cultivate if we want that mark to be a positive increase in the well-being of our community. As we undergo the studies and training that make us, we must also find a means whereby we can pass on our learning to the next generation and to those who stand beside us. It is just as important that we pass on what we have learned and what we have become through our works as it to strive to become more and find a greater ability to serve. If we do not find a means to pass those things on, then they die with us and their benefit ends where it could have flourished and grown forever. Things do not stay constant. Everything changes and nothing abides. In a world marred by greed and insufficiency, our ability to create and increase determines whether the future is dominated by these flaws or whether our ideals and visions continue to push back the darkness that threatens us. It requires wisdom to discern what to create and when. It takes courage to create that which the masses will not yet understand. It takes integrity and perseverance to stand beside what one has created. The sharing of these creations is possibly our greatest act of hospitality. The assignment for Day Three was to roam the wide world and find five blogs to follow. That was harder than I thought it would be and this post feels vaguely familiar. I found blogs that speak to my various goals and passions. There are two blogs about being a bard, two blogs about fighting and more, a blog about paganism, and the blog from a young lady on her way to a laurel and/or pelican. BardLog The first blog about the bardic arts, I was caught by the fifth installment of his new series about the Deadly Bardic Sins. I look forward to reading the rest. I am not optimistic that I will ever be a popular skald, but I do want to find the skill to enjoy my own playing and the audience response to it. Already, I have learned from this blog. Protege Life is the work of a young lady in the SCA who has taken on a great task and is kindly blogging about it so we can follow along. Her journey as a protege will be somewhat different than my journey as a squire, but I am excited to see how she experiences her undertaking. Studying Chivalry is written by an SCA fighter who, like me, wonders to what extent to our notions of chivalry can and should outline our daily lives. he is spending a year in meditation about this topic (certainly a quest worthy of a knight) and I look forward to seeing what he finds. The Lefthander’s Path concerns magic and Druidism and the esoteric. She is a member of the ADF and has a Celtic outlook where mine is more influenced by the North. She does write some on the Northern Gods and heathenism, and I find her fascinating even when I disagree with her wholeheartedly. It was through her blog that I found the Heathen Round Table. I suspect that Round table will be a huge influence on my writing habits. Santiago’s Grimoire is another blog written by an SCA fighter. A very accomplished performer and rapier fighter, he has decided to again put on the hard suit and fight heavy. We have a great deal in common including our ages and the fact that we see our fighting as part of a greater path that includes performance and Dragons. Drake Orenwood is the final bard on this list. I intyend to gather from his writing and his commentary on his own songs and works. There you have it. The seven blogs I found today when searching my interests. I hope you’ll visit some of them and find something well needed for your path. There are two people writing this blog and I am both of them. The first is Joey “Moonbase” Hall and he is just sorting some things out. You know, the usual stuff; the wars, childhood, love, life, kittens, fatherhood. That stuff. The second person is Einar Hrafnsson, a 9th Century Dane who has somehow found himself striving for knighthood in the Kingdom of Caid in AS 50. He’s far more interesting than the other guy. In fact, this post is written mostly by him. I’ve been away from my blog for several months. I got hurt, I got lost, and I didn’t write. I’m doing the Blogging 101 course again to get started and look at me: I’m already days behind that schedule. Both of the persons writing this blog and living this life are semi-educated pagans, dedicated to the worship of ancestors and Northern Gods. They are both students of runes and the secrets of the bersekr. I have ambitions. Some of them are difficult to share because they seem unlikely for me. I am embarassed of my failure in advance. I’m a fifty year old man who has been beat up by the army and other causes and I spend time training and fighting trying to win a belt I should have won before I was thirty. I do not read music or play any instrument, but I want to write poetry and music and play the lyre and recorder. More than that, I want to be a skald. I want to sing songs and make stories that honor heroes and gods and have people actually enjoy listening to them. That is worth a post on its own, perhaps. My son and I also do a good deal of woodworking. We craft bows and arrows and intend this summer to build lyres modeled after that found in Trossingen. That, too, is worth its own post. I am subjecting you good gentles to these thoughts because I want your feedback, because I want your approval, because I need your encouragement, and because I hope to somehow inspire some like minded soul to reach out in like manner. I want you to know me and to wish you knew more, even as I do for those who write the blogs I follow. I want to find here a community of warrior poets…and those who would want the company of such. I would seek the counsel of swordsmen and poets and priests. Of magicians and witches and skeptics. Of nobles and peasants and rogues. I want to find fascinating company and I hope you will be part of that. We make men without chests and expect from them virtue and enterprise. We laugh at honor and are shocked to find traitors in our midst. None of the virtues of chivalry come easily to me, but none comes with greater difficulty than humility. I can fake humility pretty well. I have no need to praise myself, no reluctance to praise others. There is no task so low that I cannot stoop to set my hand to it. But I will be oh so very concious that I am stooping. In my mental ledger I will make a mark that reflects that today I took a step toward that virtue. Then I will erase that mark as I take pride in the accomplishment. And now that I have again picked up a wooden sword and resumed armored combat in the SCA after a thirty year break, I absolutely HATE having so much to learn from these twenty-somethings that beat me so easily. Before I step on the field to practice, I think about what exactly I seek to accomplish. I have to recover my sword properly. I have to close distance with greater efficiency. Those two things are all that matter. I am not bothered if I lose, I am bothered if my Lady and my Knight have reason to say, “You’re still not doing it.” That is what I am working on. Men half my age are going to beat me then tell me how they did it. As much as I am practicing the arts of war, I am also “practicing” the Virtues of Chivalry. And I am so very proud of that. And there it goes again. There is one sword, one shield, and seven basic blows. Then, there is the pell. Every day I carry out the sixty pound base and set it up outside my apartment. Sometimes, the kids come by to watch. They ask if they can hit it. I usually drag out my six-year-old’s boffer gear and let them attack it while I’m resting. 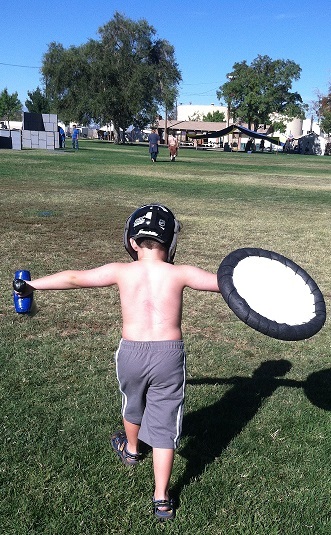 Sometimes the six-year-old, Kalev Bonecruncher the Berserk, will announce to the kids he has to train, too. Earl Syr Knarlic Wulfersson, whose squire I am, has me throwing the blows again and again and again. I have power, some small speed, but he wants the recovery to become muscle memory. Throw the blow, let gravity bring the blade down, pull it back up into the ready position. Again and again and again. Again and again and again. Again and again and again. Duke Conrad has instructed me some on my shield use. It’s a strapped round shield, and very unpopular. I am told again and again that I should get rid of it, but, for now, Earl Knarlic allows me to use it. Its used much differently from other shields and its only advantages are found in a certain offensive manner. My round shield is useless at mid range. I have to close distance quickly and then use the edge of the shield to push my opponent’s shield or sword away for an instant just long enough to strike. Start out of range but close the distance quickly and scrape the edge of the pell with the rim of the shield, throw the blow, recover. Again and again and again. Again and again and again. .
Sir Osric is a reactionary fighter. He likes to stay back and launch his attack when an opponent makes a mistake. The round shield’s disadvantages all work in his favor. I step in to close the distance and my helmet rings. I can’t find an angle of approach that defeats this tactic. He explains that I have to keep his sword busy as I close distance. It takes me a few tries to understand. he explains it again. I don’t have to hit him, I don’t have to move his weapon, I simply have to make it unwise to use the weapon as I move in. I start using an offside blow to the head (number four of the seven basic blows) hopefully requiring my opponent to block with his sword as I close that distance. And then I stand before the pell again. Start out of range and throw a distracting blow as I step in to close range, scrape the pell with my shield as I recover my sword and launch another blow without pause and recover. Again and again and again. Again and again and again. It isn’t the sword I need to master. It isn’t this impossible round shield. I’m not exactly sure what I am trying to Master. Hopefully, I recognize it when I get there, though. This was written in response to the Daily Word prompt found here.